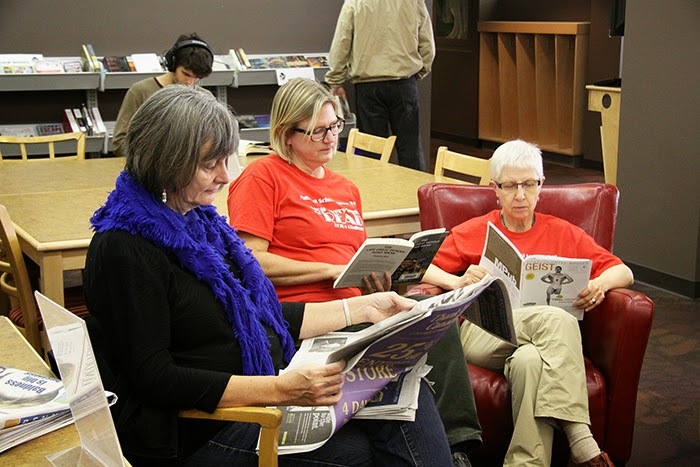 DROP EVERYTHING and READ BC 2014: Nelson Public Library Drops Everything to Read! Nelson Public Library Drops Everything to Read! While they still provided elemental and exemplary service, staff at the Nelson Public Library took 20 minutes out of their work day to join us for DEaR. Photo courtesy of June Stockdale. Nelson City Councillor Deb Kozak, NPL adult librarian and author Anne DeGrace, and NPL board chair Dianne Harke take time to DEaR in support of school libraries and literacy. And here's Anne's column in the Nelson Star in support of literacy, reading, DEaR, and school libraries! A huge thanks to the staff and board members at the NPL for continuing to be our community literacy leaders!